Ground Handling International has been serving the global ground handling industry for over 20 years by providing an essential blend of industry news, in-depth features and coverage of a wide range of issues of relevance to those involved in decision-making within the handling sector that includes all aspects of above and below the wing operations including cargo handling. Today the title is recognised as the voice of the handling industry and has become essential reading for any handler across the globe. 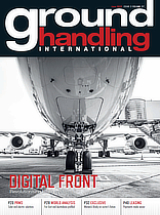 Ground Handling International is published six times a year in printed magazine format and is also available in electronic format. With over 20 years of experience in organising top level conferences that are targeted at the decision makers within the aviation sector, Ground Handling International's events have become the sector's benchmark. For industry updates, topical presentations, forums, One-to-One Meetings and networking, they offer the ultimate service to senior executives who are actively engaged in the international handling market.